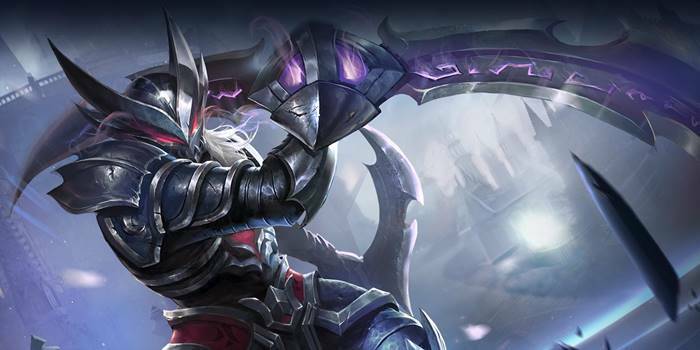 An overview and guide for Arena of Valor's Nakroth, the Executioner's Blade. Nakroth is an extremely mobile Warrior/Assassin who can also deal decent damage. Nakroth is a complex assassin/warrior hero who can quickly maneuver around the map to pick off targets and help push objectives. He has a number of low-cooldown movement abilities in his kit, allowing him nearly unparalleled speed. Highly Mobile – Nakroth’s first two abilities, Jury Fury and Death Sentence, each provide Nakroth a short dash, Jury Fury able to used twice. With enough CDR items at his disposal, there’s not a hero in the game that can catch up to Nakroth. Great at Ganking – With Nakroth’s excellent mobility, he has an easy time jumping targets the moment that they overextend. With high amounts of damage and some moderate crowd control, Nakroth can rip up his targets before they have a chance to escape. Effective Split Pusher – Nakroth’s mobility allows him to move quickly to any empty lane. His focus on attack damage and normal attacks allow him to quickly knock down minion waves and tear towers apart. Falls Off Late Game – Despite his effectiveness early game, Nakroth is more of a liability later in the game. He can quickly be burst away and isn’t so great at team fighting and thereby won’t be a huge help once the teams start sticking completely together. Nakroth excels at jungling, able to clear the neutral creeps very quickly and effective at ganking. His high mobility allows him to quickly move between the lanes to help wherever needed.. Always gank lanes, utilizing his mobility to catch up to and execute unsuspecting enemies. Nakroth’s Jury Fury and Death Sentence both are gap closers that can ensure a kill most of the time. Ganking also gives an advantage to your allies as it pressures enemies into using their talents prematurely and even force them to recall early. Jury Fury is the best ability to max first, as each level decreases its cooldown as well as raising its damage. In contrasst, Death Sentence only increases in damage with each rank. In addition, Death Sentence is Nakroth’s primary initiate, escape, and general mobility tool. Solo Battle – Engage onto an enemy with Jury Fury to stun them and immediately use Judgement’s Blade while they are caught in your initial stun. Only use Death Sentence as an engage when you need to close a large gap and you know where the rest of the opposing team is. Using all of your mobility right away only to run into control effects will mean certain death. Team Battle – Nakroth needs to get close to squishy carries like mages or marksmen. Sneak in from the sides to avoid getting stunned or focused by the enemy front line and killed. Use Nakroth’s high mobility to stay outside of enemy range after having killed your target before moving focus to another. Escaping Enemies – With both of his basic abilities granting mobility, Nakroth can escape dangerous situations with ease. His abilities can also jump through walls which is very helpful in traversing a map. If everything is on cooldown and you want to avoid crowd control effects, use Judgement Blade. Dread Judge – Passive – Every 4th normal attack knocks the target into the air. Each time an ability hits an enemy, Nakroth gains 50% attack speed. Spam abilities when engaging an enemy in order to keep up the attack speed bonus to maximize damage. Landing your abilities and auto attacking is crucial in team fights as it can stun enemies while granting you tremendous attack speed. In testing the duration of the attack speed buff, we found that it wears off just before the halfway point of the Jury Fury timer, so roughly 2.4 seconds. Jury Fury – Nakroth lunges forward and knocks the target into the air, dealing 135/151/167/183/199/215 (+0.65 AD)ˀ physical damage. The ability can be used again within 5 seconds of first use before triggering the full cooldown. The second cast of this ability does not stun the target. Instead, it deals the same damage as the first one without the knockup. The second cast does trigger his passive attack speed buff. To maximize damage, use the second cast when the timer is about halfway through. If you want to maximize mobility, use the second cast as quickly as possible, because the ability cooldown timer will not begin until after the second cast. This ability is useful for going in a team fight, dealing damage against the squishies with help from your ultimate, and quickly getting out. Do take note that you must do this in five seconds before the second cast expires. Death Sentence – Nakroth flips backwards and the next normal attack within 3 seconds becomes a horizontal sweep that deals 150/180/210/240/270/300 (+1.2 AD) physical damage. Be careful when using this ability, as Nakroth will go the opposite direction of the ability arrow. Be sure to definitively swipe in the opposite direction that you intend to go. Though this ability does a lot of damage, it’s your primary escape tool, so be certain of the battle situation when you use it as an engage. Death Sentence helps Nakroth jungle very quickly, as he can jump through walls to his next monster target and trigger Dread Judge in the process. Judgment’s Blade – Nakroth swings his blades against enemies in range, dealing 130/180/230 (+0.65 AD) physical damage each hit, with the last hit knocking enemies into the air. He is immune to control effects during the ability. Judgement’s Blade cannot be cancelled, effectively causing Nakroth to stun himself when casting. Make sure that you can stand a bit of return fire before casting. Judgment’s Blade has a rather short range, so pay attention to your positioning before casting. Nakroth’s standard combo is to use Jury Fury to knock up the opponent, then immediately cast Judgement’s Blade for massive damage. Continue auto-attacking, then use the second cast of Jury Fury and/or Death Sentence to chase or retreat, depending on the situation. Keep your distance from Nakroth, a very long one, since he can dash up to three times and easily close the gap between you. Maintain distance whenever his dashes are on cooldown. Stun Nakroth whenever possible. The assassin is very vulnerable when unable to move, lacking much when it comes to defense. As a physical assassin, Nakroth should focus on physical damage in order to maximize his damage potential. Onslaught, Guerilla, and Skewer are some of the best choices when building up his lethality. An alternative choice is to boost Nakroth’s defenses to make him a bit hardier in fights. If attempting this, players should grab sets of Indomitable, Benevolence, and Valiance. Nakroth should avoid tanks. Their high durability make tanks difficult targets to burst down and most provide some sort of crowd control that can lock Nakroth down. The assassin should instead focus on squishier foes, avoiding tanks whenever possible. Warriors are also low on Nakroth’s priority list in team fights. Much like tanks, warriors will generally be fairly durable and thereby hard to tear down. They additionally tend to have some damage on their side as well, making dueling difficult. Only engage warriors if you have a hefty gold or experience advantage over them. A fight between assassins generally comes down to who was able to jump the other. Watch level and gold advantages carefully before engaging to avoid rushing in to get burst down by your opponent. Mages generally rely on crowd control and a range advantage to defeat foes. As a result, many are easy prey to Nakroth, so long as he can get the jump on them. Marksmen are both the easiest targets for Nakroth to tear down and the first priority he should have in fights. The squishy damage dealers generally don’t have much in terms of escape mechanisms and can thereby be easily dealt with. Supports are tricky targets. They are rather easy to deal with when alone, but can be a huge pain when paired with an ally. Catch them should one ever overextend or step out of position, but save them for after the damage dealers in team fights.